Fitbit has been designing fitness trackers for a long time and it’s the only thing the company is known for. But recently, with the launch of the Fitbit Ionic, the company has decided to step into a new world of smartwatches. The Ionic offers a similar feature set and proves to be a serious contender to the expensive Apple watch. It is the smartwatch that you want to wear while going out for a run or hitting a gym. However, the intrusion of Garmin into the smartwatch world, with the introduction of Forerunner 645 and the LTE equipped Apple Watch Series 3 and Series 4 can still be a big challenge for the Ionic. The Fitbit Ionic feels lightweight and is a comfortable fit on the wrist. It is waterproof and you can take a shower or dive into the swimming pool while wearing the watch. The watch’s body is built with aluminum and small antenna bands can be seen on the sides. It’s attractive and one can easily say that it’s an amazing product from the Fitbit so far. However, the people’s opinion is found to be rather divisive on design. Some people may not like its look but others, on the other hand, would love it. You may be one of those who love the look of the Ionic but if others’ opinion bothers you, then you should bear in mind that it’s not as nice-looking as, say, the Apple Watch. You will find one physical button on the left side of the watch and two on the right like those placed on the Fitbit Blaze enabling you to access various options on the watch’s UI. The buttons are slightly raised making the UI simple to work with, which allows you to swipe through different apps on the touchscreen. Unlike the Apple watch or other Android smartwatches, the Ionic has a rectangular display with full-color screen. It tends to remind you of the Blaze’s screen. The Ionic has a slightly bigger screen though, because of the more shrunk bezels. Still, there is a lot of wasted space above and below the screen. 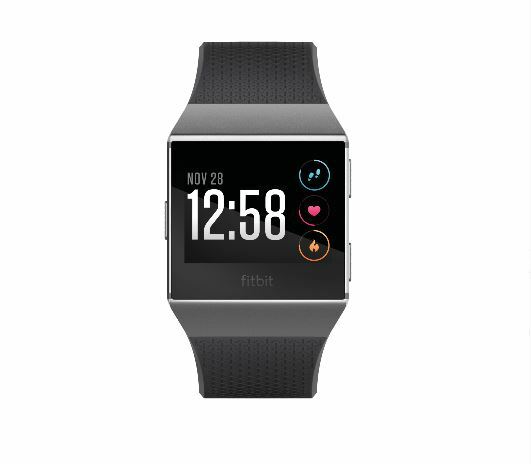 The Fitbit logo is awkwardly placed below the screen taking up quite a bit of space which could have been more useful. The LCD screen has the resolution of 384 x 250. It’s bright enough and can be viewed even in direct sunlight. It can reach 1000 nits like the Apple Watch Series 2. The Ionic has all those fitness tracking features that you have seen on other Fitbit products. Some of them are upgraded for better performance. Thanks to new upgraded algorithms and a perfect design that sits close to the skin, now heart rate tracking feature on the Ionic, as said by the company, has become more accurate than it ever was on other Fitbits. It worked quicker when tested and found to be as accurate as other fitness trackers and watches. It’s useful for exercise and using the same heart rate tracking data, a lot of other information is displayed in Fitbit’s app. A built-in GPS now ensures a better connection than the Fitbit Surge as the antenna bands are now placed in most favorable position for better tracking. It sometimes takes a little longer than usual to connect to the GPS but we never lost the connection while running. It includes some new features for running such as, it will pause for a moment automatically when you, for instance, stop to cross a traffic signal or take a break, then resumes once you start running again. Workouts are also added in Fitbit Coach feature that can be accessed from the watch and offers similar functions as Fitstar app, which can be downloaded on the phone. These customized workouts tell you exactly what to do and after finishing a task, you can leave feedback, and the Fitbit Coach will guide you with something harder or easier for the next time. This basically helps you improve and encourages you to try different exercises. The company also plans to include audio workouts to the Ionic and if it happens, it would be an amazing addition. This Fitbit also comes with SpO2 sensor, which measures blood oxygen levels; however, it doesn’t seem to be operational yet and still remains a “work in progress”. For diabetes patients, the Ionic also proves to be very helpful as it pairs with the Dexcom G5 Mobile sensor (costs about $900) and you will be able to monitor your glucose levels. Ionic is a vital device for those with diabetes. The Ionic is a water-resistant device up to 5ATM (50 meters) and lets you take shower or swim. However, it depends on whether you are a serious swimmer or the one with a casual approach. If you are the latter, the Ionic would help you track length, distance, and pace. But for serious swimmers, it is recommended to take off the watch before you jump into the pool and look for some alternative options. With limited usage, the Fitbit Ionic’s battery lasts about 5 days. But if you are taking it with you a lot while going for a workout, the battery life probably won’t meet your expectations. It especially gets hit hard when GPS is active. The Fitbit claims the battery life to be around 10 hours when GPS tracking is on. This estimate proved to be true when tested. The Ionic remained powered up for the same amount of time. And any average watch would show you exactly the same figures. The Fitbit Ionic is a great wearable with a lot of new and upgraded features but the people had expected more. There are plenty of positive attributes to consider such as built-in GPS, Automatic pause option, Fitbit Coach and good battery life. But a lot of things are still absent like the long-promised SpO2 sensor feature. The Fitbit has turned this device into a fitness tracker than a smartwatch if we talk about features. The Fitbit Versa has a lower price and packs almost same features. The only thing missing is the GPS and it means you will be going out for running with your phone. Apart from that, the Versa has a lot to love and is highly recommended.